In any city where we choose to spend time, finding a spiritual fulcrum is paramount. We need our own touchstones, however foreign they may be. Mine is the stooping stupa of Koh Kret, an island in the Chao Praya River about 20km north of Bangkok’s city centre, created in the 1800s when a canal was carved to shorten the journey from the former Ayutthaya kingdom in the north. Off the beaten tourist track, Koh Kret is a special treasure, both for its rich history as a home for the Mon tribes and for its bucolic beauty that survives even in such close proximity to Bangkok. There are no cars on the island, just motocy taxis, bicycles and diminutive long-tail boat river ferries that serve the dozens of little landings. Famed for its intricately carved pottery, the island is a favourite weekend jaunt for thousands of Thais who descend to scoff fried river fish and a local equivalent of tempura. The market stalls sell an ever-increasing load of plastic garbage, but the pottery, made from the local clay and unglazed, comes in all shapes and sizes from a simple goblet to an enormous maw nam, or water container costing thousands. Time, flooding and the dying of an ancient craft mean the once-thriving pottery industry on Koh Kret is a shadow of its former self. Just the odd shop and a desultory potter’s wheel and kiln or two remain for the benefit of tourists. 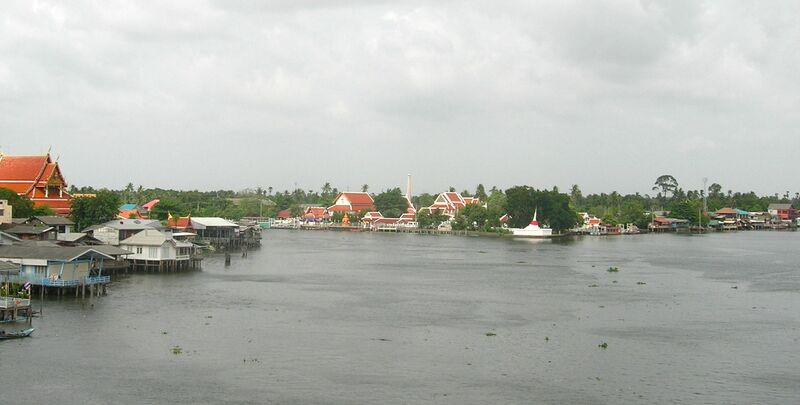 Koh Kret offers historic temples, including Wat Poramaiyikawat in the old Burmese style opposite the local town of Pakkret near the main ferry landing. Featuring Italian marble imported by King Rama V, the temple, museum and monastery all exude a sense of peace. 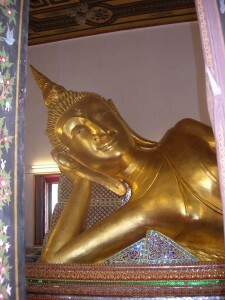 Nearby the mesmerising 10-metre reclining Buddha statue from the late Ayutthaya period rests in splendour at the pavilion of Phra Wiharn. Recently renovated, the pavilion’s black and white marble tiles are cool to the touch and if you lie on the floor you can regard the ceiling, so intricately painted in a symmetric pattern. The Buddha’s feet are a masterpiece of gold and inlay. Watching temple devotees painstakingly restoring the glorious ceiling and statue, I found them almost other worldly in their quiet dedication to the fine task. At the former bend in the river at the mouth of the artificial channel, Koh Kret’s striking white Mutao stupa or Burmese-style pagoda is hundreds of years old and prone to subsidence, hence its leaning tower effect. You can feel the surge of the Chao Praya River as its brown waters part at the foot of the pagoda, giving way to the purposeful channel and to the broad reach of the river as it snakes around the island. Traditional wooden stilt houses, Buddha statues and the odd local restaurant deck line the shores. River traffic is a watcher’s delight, from tourist gin palaces to the sturdy little tug boats chug chugging with the tide, drawing behind them barges laden with rice, sand or soft drinks. It is a working river. You can rent a small boat to take you around the island of Koh Kret, although walking the sandy pathways is a treat in the cool season, while the more energetic can hire bicycles although it is hard work peddling in the heat or steamy monsoon season. Somewhat unkempt and overgrown, the Kwan Aman Pottery Museum in the main covered market stretch has an extensive collection of old locally produced Mon pottery, guarded by scabrous dogs and cats. It appears not to have been dusted in a decade, but the decay is quite charming. Access to Koh Kret is not straightforward but if you get yourself to Pakkret the taxis all know where to go if you simply say “Koh Kret”. A tiny ferry does a frequent crossing of the canal and costs just 2 baht! It is my island in the stream.